The way these wonderful flavours come together in this dip has made it a family favourite. I’ve soaked cashews to use in place of chickpeas in my paleo version of ‘hummus’. Serve with Rosemary & Seed Crackers (recipe here) and vegetable sticks. 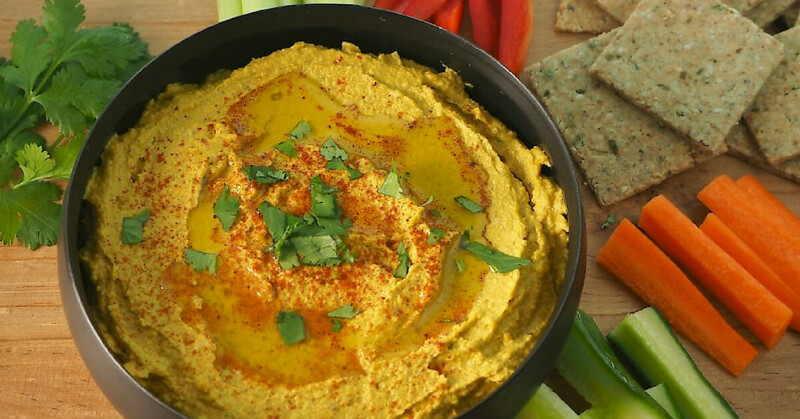 Add the drained cashews, tahini, lemon juice, remaining 2 tablespoons olive oil, coriander, garlic, cumin, smoked paprika, salt and carrot, to a blender. Use the tamper stick to push the ingredients onto the blades to help with blending. Stop after 10 seconds and scrape down the sides of the jug, continue blending until well combined and you have reached your desired texture. Add extra olive oil if you prefer a very soft texture (depending on your machine you may need to stop several times and scrap down the sides of the blender jug). Next PostNext Netflix’s 13 Reasons Why Season 2 – Do We Need to Talk to Our Kids About Suicide… Again?